short, easy words: It won't fit! About the books - I am not all that pious, I wish I were. I do not know exactly what I believed about prayer until now. I think by nature I am a bit cynical; I also believe very firmly that everything is in the hands of God. I did not grow up with specific prayer requests. The Lord's Prayer was the example. It never seemed necessary to be more specific. Am I making sense, here? In the 90's, a couple of tragedies struck in short succession. My father and brother died, and my husband was diagnosed with cancer. (He has been in remission for more than 10 years now) I did not feel as if specific prayer was "effective" then, in any measurable way, apart from asking God to convince me that His mercy alone would be enough. Actually having long internal debates, trying to convince God that it might not be, and then what?! I know, it would still have been enough, but I was only 22 then. As He promised, nothing could separate me from his love. However, I fear that I might have become a bit cynical in terms of praying for anything specific. This book, and I am only a few chapters into it, may answer some questions. I trust God to keep me safe, spiritually. I just do not know how much more I should ask, since that seems to be enough. So, in a nutshell, that is why I am reading "A Praying Life." 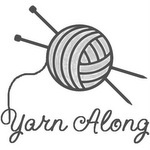 Once again, I am linking up with Ginny's yarn along. Oh Emma, please send us some of your heat, we would love some here! You are a strong woman Emma, I like the way you talk about your faith and your relationship to God. I am not very good at talkig about those issues, I somehow fear people might think I am some kind of freak so I keep it to myself and admire people like you who are so honest and not freakish at all :-) Do you know what I mean? Dear Geshe - ironically, the year I spent in Germany, they had a "Jahrhunderdsommer" - I complained of the heat even when I lived in Germany ;) With no air conditioning and homes built to keep the heat inside, you perhaps want 5 degrees of this, no more! Your beautiful trees will all wilt and look very sorry for themselves, just like me. One of my favourite quotes from G.K. Chesterton: "When people stop believing in God, they don't believe in nothing — they believe in anything." It is strange how the pendulum swings, to not believe would have made you a "freak" in Europe 200 years ago. I certainly did not find any believers in my year in Europe, you are full of surprises. Melva pointed out: Gesche, not Geshe. Sorry! Thank you for that quote, so true! The gauge thing! I'm afraid I rarely do it either, sometimes it works and sometimes it DOESN'T but I never seem to learn my lesson. I like the sound of A Praying Life, I think I would find it very useful. I am at present doing a bible study, alone, as there are no groups here. I'm finding the old testament very long, and am a little confused by prayer! This may come out sounding very 'wrong' but here goes - If God has a pre-written plan for all off us then why pray for anything specific? I just figured that prayer should be about giving thanks for his mercy? Please correct me if I am wrong! I would appreciated any 'help' I can get. 41.6 are you sure, that's like HOT, my goodness how do you cope? The Old Testament is very long. I have not read every word, to be frank. (I keep reading bits that makes m think - now this, taken out of context, could be used to attack and distort Christianity!). As to prayer, I guess I am pretty much where you are. I think that is a good place to be. It's a mystery. As are most things good, true, and/or beautiful. Thanking God for His Mercy is a good place to start, yet people throughout the bible prayed, sometimes for specific things. Paul says we should pray incessantly. Jesus himself prayed that this cup would pass. Where else can you start, other than by, as you say, giving thanks for His mercy? Grace alone. As long as we think our salvation is something we have to do, could do, should do, will learn how to do, we miss the essence of the Gospel. We cannot save ourselves, we were dead, and He saved us. Unfortunately, that does not sit well with the self-esteem movement of the day. I must add that this does not mean that faith without any "good deeds" or fruits of the spirit is what we aim for. A tree without fruit is dead, or at the very least, sick. We know a tree by its fruit, Jesus was very clear about that. I hope you keep reading, I will too. Thanks! Unfortunately, the locals say, and they know, that this is only going to get worse. The first year in Austin they tried to comfort me by saying that it cools off by the second half of September. It is like hearing that you will only be sick and tired for the first 14 weeks of pregnancy, when you are in week 5! oh dear emma, as far as gauge perhaps the heat is throwing you off? 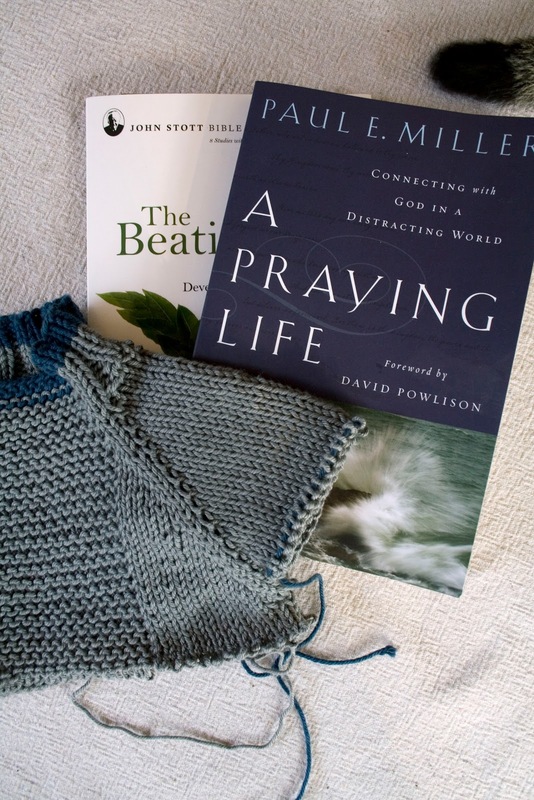 with knitting there is always something to learn. i hope your books bring you answers and comfort and a connection. Nope, I am afraid I cannot blame the heat for my knitting, only for my gardening! About comfort and connection - the books can help, I am sure. In a short time, your example has taught me much about the fruit bearing side of it all. With life, there is always something to learn.